Although not something we think about every day, accidents are daily occurrences in Guelph and many other Ontario communities, with minor to catastrophic consequences. Long and short term injuries affect both victims and their families and can be emotionally and physically stressful and draining. There are many different causes of accidents, but motor vehicle collisions are one of the most common and avoidable contributors to personal injury in Guelph. If you or someone you know has been hurt in a car accident, the personal injury lawyers at ILO are available to represent you and ensure the best possible compensation for your claim. Motor vehicle accidents are never anticipated, but all too often tragic. In the latter months of 2013, a Guelph Transit bus driver allegedly caused a five vehicle crash when he crossed the center lane and hit another vehicle. This was the catalyst for the rest of the vehicles who were unable to stop in time and thus also became accident victims. Police charged the then fifty-one year old male with dangerous driving and dangerous driving causing bodily harm. Another accident in Guelph was caused when a fifty-five year old woman suffered a medical emergency while driving. Her vehicle crashed into an SUV that was stopped at a red traffic light. Although the driver of the SUV was unharmed, the woman did not survive her injuries. Safe driving practices certainly reduce the likelihood of an accident, but regrettably, there are some events (medical or otherwise) that are beyond our control. Further, there will always be a risk that another car or truck may collide with our own vehicle, particularly as Ontario roads are becoming increasingly congested. Regardless of an accident's cause, it is imperative that accident victims seek medical attention when hurt or injured in an accident. The severity of injuries may not be immediately apparent and may be further exacerbated without medical treatment. It may also undermine your case if you wait too long to report your injuries or to have them professionally assessed. Post-traumatic Stress Disorder (PTSD) is one of those “silent dangers” that if not treated properly can have catastrophic effects on the person suffering from it. Usually associated with war veterans, PTSD can also affect people who have been hurt in car accidents and other traumatic events. 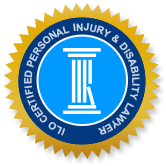 Personal injury does not refer solely to physical injury; it encompasses any sort of damage to your health and functionality. PTSD symptoms in children are similar but there are a few noticeable differences in their behavior, such as separation anxiety from a parent or re-enacting the incident during play-time formats. Regardless of the age of the affected individual, PTSD is a disorder that should be treated immediately. After seeking medical attention, it is important that accident victims contact the Guelph Injury Lawyers of Ontario (ILO) law team to represent their best interests when making an insurance claim. We have the experience and necessary resources to get you the compensation you deserve. There is no cost for your initial consultation.